As farms and ranches continue to consolidate, we will see fewer new openings each year. More individuals filling these jobs will have bachelor’s degrees, but farm or ranch experiences will still be very important in hiring decisions. Numbers of job openings in sustainable forest management are expected to stay about the same, as will the number of graduates. While numbers of large commercial farms and ranches will decrease, there will be more producers growing fresh fruits, fresh vegetables, and organic crops located near towns, cities, and metropolitan centers. More consumers will search out locally grown foods. Poultry and swine production managers will be in demand. Foresters and ecosystem managers will continue to find jobs with government agencies and private forest management firms. However, relatively more of the new positions will be in the private sector. Precision agriculture specialists who provide products and services for farmers and ranchers will likely be in demand. There will be continued strong demand for qualified and certified pest control specialists in agriculture and forestry. As in the past, certified crop advisors will be sought by growers of major agricultural commodities, including wheat, corn, soybeans, and cotton. More often than in the past, food production consultants will find jobs working with growers to assure compliance with contracted production management operations. Graduates with degrees in sustainable crop production and management will likely fare better in the employment market than will those with degrees in animal production and management. 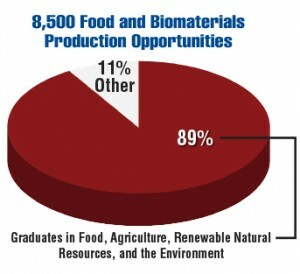 Graduates in animal specialties will continue to outnumber those with crops credentials in the next five years.